The utmost in versatility: a single connector to connect even 4 couplings to a single 3/4" tap, independently regulating water flow on each way. Tool-free installation. Ensures a stable, leak-free connection. Its ergonomic design makes it easy and convenient to use even with wet fingers. 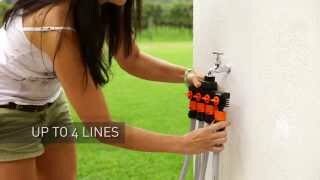 For taps with 3/4” thread; enables assembly of each separately controlled, enabling different areas to be watered. Easy attachment by simply screwing on.